U.S. 42 north of Delaware was closed following a two-vehicle crash Monday morning. The crash involved a tractor trailer and a car. Troopers from the Delaware Post of the Ohio State Highway Patrol said injuries were reported. Two people were transported to hospitals Monday after a crash on U.S. 42 that closed the highway for several hours. 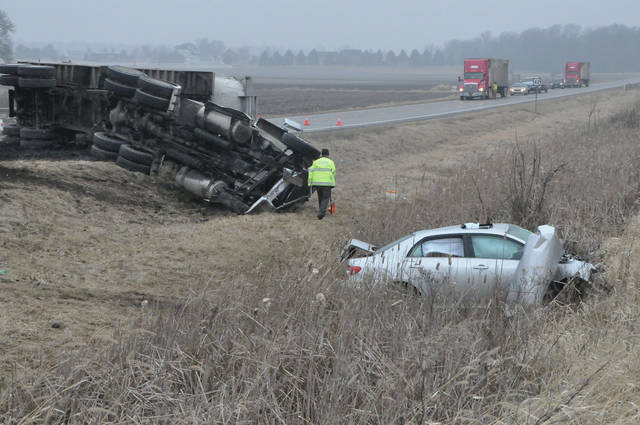 Troopers from the Ohio State Highway Patrol reported Monday afternoon that around 11 a.m. a semi-truck driven by Glenn E. Fathbruckner, 57, of Delaware, was traveling north on U.S. 42 near County Home Road when a car driven by Teodula Gregory, 71, of Sunbury, failed to yield at the stop sign on County Home Road and was struck by the semi. Troopers report Gregory’s vehicle went off the right side of the road while Fathbruckner’s truck overturned. Troopers and Delaware EMS arrived on scene and transported Gregory to Grant Medical Center to be treated for incapacitating injuries. EMS transported Fathbruckner to Riverside Methodist Hospital to be treated for non-life threatening injuries. The crash blocked U.S. 42 for several hours until crews were able to move the truck around 2:30 p.m. and the road reopened. Troopers report the investigation is still ongoing. Weather and alcohol are not being considered factors in the crash. Troopers said both parties were wearing their seatbelts.